Some say the evangelical church in America is in a time of transformation. I say it is on the precipice of total disarray. I realize my perspective is limited, and I’m hopeful we can still get it right in the end. But I cannot deny the obvious. The issue is not politics or culture but, rather, theology. 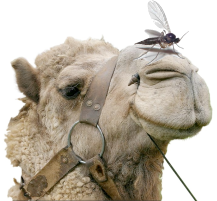 When Jesus rebuked the scribes and Pharisees, He called them “blind guides, who strain out a gnat and swallow a camel!” (Mt. 23:24). They concentrated on trivialities while ignoring essentials. Unfortunately, a significant segment of the evangelical church today is swallowing a “camel” while busily straining out the “gnats.” In this case, the essentials are the fundamental, theological truths of Evangelicalism: the core beliefs of Scripture that should guide us in our walk, inform our witness to the world, and identify us as people who worship and honor the Lord Jesus. What are the so-called gnats? They are nuisance statements from people who have little or no understanding of true Christianity but, nevertheless, feel duty-bound to pontificate about it. Such people particularly dislike conservative Christians, often calling them narrow-minded and intolerant for sticking to biblical principles that oppose society’s immorality and growing contempt for God. In fact, many evangelicals themselves are in a quandary when they read what God has clearly said on a subject and then apply that truth to the corroded culture around them, only to find themselves marginalized or even demonized by popular voices labeling them as strident, delusional, or divisively partisan. Clockwise from top left: Ross Douthat, New York Times op-ed columnist (Robin Holland/Corbis) ; Jon Meacham, Time contributing editor (Stephen J. Boitano/NBC/NBC NewsWire via Getty Images) ; Dr. Deepak Chopra (Hutton Supancic/WireImage/Getty Images). The world can tolerate a Jesus who is loving and full of grace. But it winces—as all of us should—at His stinging rebukes of hypocrisy, dishonesty, immorality, and spiritual deception. Yet because those passages give us the most discomfort, we probably should pay the greatest attention to them. A Jesus meek and mild doesn’t indict or convict. But that picture of the Savior doesn’t exist in the New Testament. Jesus is tough, confrontational with religious heresy, and uncomplimentary about the world and its true ruler, Satan (Jn. 12:31; 14:30; 16:11). For gay activists who claim Jesus said nothing about homosexuality, I invite them to study the fact that He said everything about heterosexual marriage as the biblical, God-ordained norm. For people who believe Christians should exit politics, I recommend reading Acts 16 where the imprisoned apostle Paul led the Philippian jailer and his entire household to a saving knowledge of Jesus Christ. Then he held the equivalent of a political sit-down strike to protest the corrupt magistrates’ sanctioning of his illegal arrest and jailing as a Roman citizen. According to a recent Pew poll, most Americans don’t understand the doctrinal differences between Mormonism and Christianity. When asked whether Mormons should be categorized as Christians, 51 percent said yes; 49 percent said no or don’t know. When pollsters asked the same question to people identified as white, Protestant, evangelicals, 35 percent said yes; 53 percent said no; and 12 percent did not know. That means 47 percent of evangelicals polled neither knew nor cared enough about the doctrines of the Christian faith to realize the core beliefs of Mormonism differ drastically from those of Christianity. Shockingly, the percentage is merely four points away from the 51 percent of the general population polled that came to a similar conclusion. We can only wonder what most Christians really believe about the essentials of the faith. One reason believers deemphasize theological truth could be the fear of appearing “shrill” and “extreme.” But there are other reasons. We are submerged in a flood of misinformation about Jesus, the Gospels, and Christianity. Deepak Chopra, a popular “mind-body healer” and mystic, has written a book called The Third Jesus. Do born-again Christians realize that, when he talks about Jesus and quotes from a Gnostic “gospel,” he is citing an unknown author who wrote more than a century after the apostles? Do they know that 1,500 years ago the Church Fathers rejected that source not only as unauthentic and not divinely inspired but also as heretical? Do followers of Christ see the divergence from their own biblical understanding when they see mega-icon Oprah Winfrey join with an all-female group in an earth “healing” ceremony in Hawaii, or when she travels to India on a junket with Chopra? There is clearly a feel-good element to these anti-biblical worldviews. Eastern mysticism can be inviting because, after all, it is ambiguous and nebulous enough to defy objective analysis. Therefore, it avoids the necessity of a reasonable defense. Christians do not have that option, nor should we. Rather, believers should “always be ready to give a defense to everyone who asks you a reason for the hope that is in you” (1 Pet. 3:15). Scripture, of course, uses the term mystery. But it denotes a truth God hid from human understanding then revealed in the New Testament. In Ephesians Paul spoke of the “mystery of Christ, which in other ages was not made known to the sons of men, as it has now been revealed by the Spirit to His holy apostles and prophets” (3:4–5). He asked believers to pray “that I may open my mouth boldly to make known the mystery of the gospel” (6:19). Followers of Christ possess God’s revealed Word and, guided by His Spirit, can discern its essential truths (1 Cor. 2:14–16). Thus we have the opportunity to understand the Scriptural doctrines of our faith. Equally important, we have the mandate to understand, promote, and apply them to our lives. The New Testament speaks of the importance of the “apostles’ doctrine” (Acts: 2:42) as opposed to “strange doctrines” and “myths” (1 Tim. 1:3–4, NASB) that later would frequent the so-called Gnostic gospels. Nor are we to be “carried about with every wind of doctrine” (Eph. 4:14). Instead, we are to be nourished by “good [sound] doctrine” (1 Tim. 4:6) that comes from Scripture alone (2 Tim. 3:16). Some of us may not spend time studying doctrine because it appears dreary, overly theological, unexciting, or sometimes even irrelevant to our lives. Yet if God spoke so often to us about it through His apostles, how can we ignore it? More important, why would we choose to? It is the sword of truth God has given us as an effective tool of spiritual victory. 1 Ross Douthat, “The Tempting of the Christian Right,” December 6, 2011, The New York Times <campaignstops.blogs.nytimes.com/2011/12/06/the-tempting-of-thechristian-right>. 3 T. M. Luhrmann, When God Talks Back (New York, NY Alfred A. Knopf, 2012), 316–317. 4 Charles Haddon Spurgeon, cited in Steve Miller, C. H Spurgeon on Spiritual Leadership (Chicago, IL: Moody Publishers, 2003), 106. Question: How should evildoers be dealt with?